Is it okay for a priest to use a hoverboard in church? The Catholic church says ‘no’. If you’re considering leaving the church you attend, there are a few things you may want to consider before making the leap. The new year is always a time for big decisions, big hopes and big disappointments. If you work on Christmas Eve or Christmas Day so others can celebrate, this is a big 'thank you' from all of us. It's Christmas Eve as I write this post. Today and tomorrow are busy days for pastors. While many others get a break tonight and tomorrow, pastors like me are hard at work. How do we keep Christ in Christmas when Santa is everywhere we look? Can we have fun with the Santa story? Or is that diluting the true meaning of Christmas? If you're scrambling to find a fresh idea from the Christmas story for Sunday and Christmas Eve, these steps might help. 39 verses. Less than 900 words. That’s everything Matthew and Luke wrote about the birth of Jesus. But grace is God’s scandalous response. Why are some Christians so quick to diminish simple statements of grace with a ‘yeah, but’ response? We don't just go to church, we are the church. But the going helps in the being. When people say we don't go to church, we are the church, I resonate very deeply with them. The church is not a building or an event. It's people. But there's a part of me that resists saying we don't go to church. Because we do. For a guy who doesn’t preach on politics, my recent post about not preaching on politics sure has me talking a lot about politics lately. Some people love to complain. Many of them find their way into our churches. They especially like small churches. In a big church, chronic complainers get lost in the crowd. The pastor may only be aware of them by email (but so many emails!). There’s a big difference between good small church choices and bad small church choices. Here are some good ones. 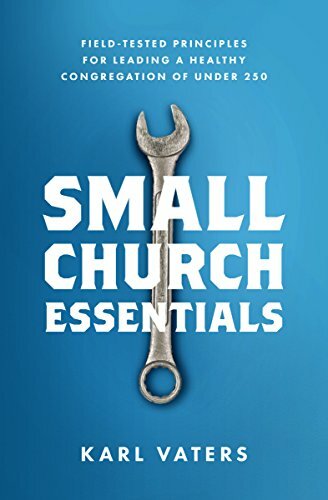 Small churches don't need to make big church choices in order to become great churches. We need to make better small church choices. Social media has become our face to the world. When we use it well, it can be a great tool for ministry and relationships. Preachers need to take our cue from God's Word, not the current obsession of the 24-hour news cycle. I don’t speak on political issues in my church. I never take a side on controversial news items when I'm behind the pulpit. And I’m tired of being called a coward because of it. Is it possible to find success in ministry outside the church growth numbers? It depends who gets the credit. We want numbers to verify our successes. There are two huge problems with that sentence – and they’re found in the words numbers and our. First, not all successes have numbers to verify them. Second, the successes of the church are not our successes.